I finally turned the heat on today...not that it was really that cold, but it's chilly and wet feeling and gloomy. It has been getting down in the low 50's at night, but warming up into the 70's during the day. However, the house was a chilly 68 degrees, and in light of the cloudy, gloomy overcast day making it feel much colder than it is, I caved. Zoe thanked me for turning on the heater, though I don't have the thermostat turned up high enough to keep her from being very snuggly! I'm still her favorite heating pad!! It's unusual for us to have not had at least a few cold days by now, but I'm not complaining. I don't like winter at all. The cold and dark days are depressing to me. If I had my way (and had enough money), I would live in a warm, sunnier place near the ocean. One where the days don't get so short and dark in the winter. One where it NEVER gets icy. Where you can swim in the ocean all year long (and of course, there wouldn't be any sharks). Where really cold weather would consist of temperatures in the 50's. Paradise. Sigh. What in the world am I doing in Oklahoma? We had our first freeze this week and I am beginning to see some trees starting to change color. It will be awhile before they really get pretty. I'll try to get some pictures...if I have the opportunity to be outside when it isn't dark. You see, this daylight savings time "issue" is really discouraging me. It's dark when I go to work in the morning and it's dark when I get home. I'm getting way too much dark. 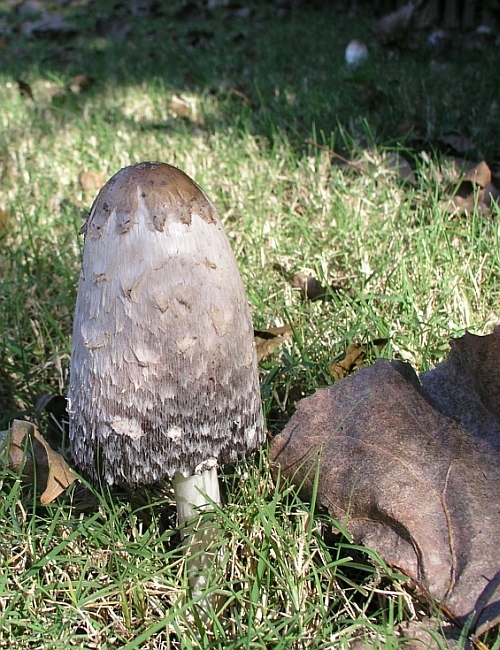 Which brings up my next dilemma...mushrooms! 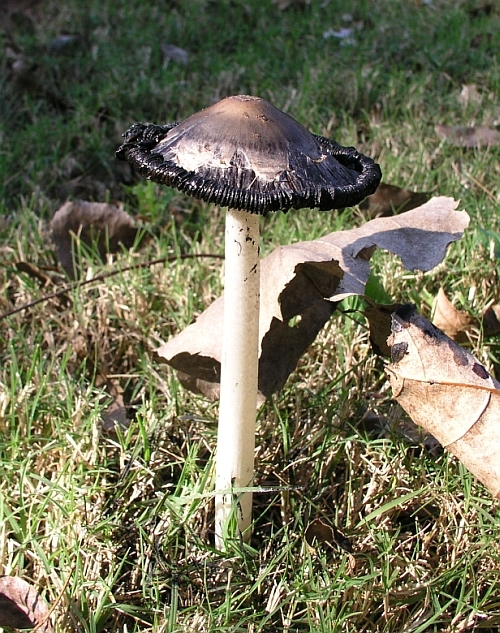 Leaves are falling and those darned mushrooms are growing all over the place! They start out looking friendly. But they turn into this ugly toxic-waste-dump type "thing" after they grow up. 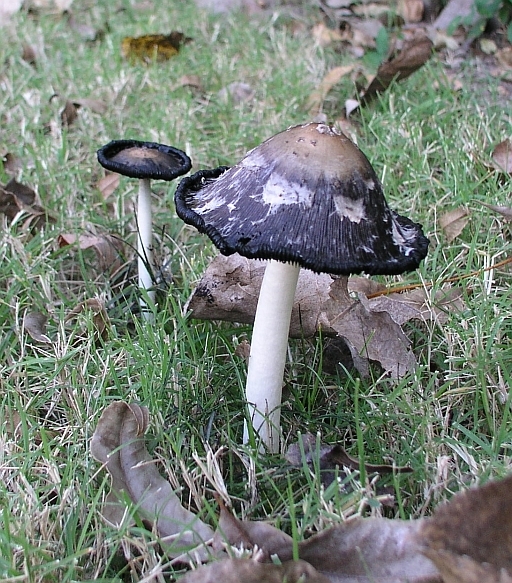 They even make the grass black all around them. It's almost as if they have some kind of yucky tar that oozes from them. Needless to say, I try to pick them before they reach the ugly toxic-looking stage. I've been tossing them over the back fence with great regularity. Here's Zoe watching yet another one sail over the fence! Happy Birthday to my brother, Mark!!! Since I'm not having birthdays any more, I'm sure he is now older than I am, even though it started out the other way around. Can you believe that I saw a SNAKE yesterday...sunning on my patio!!! It's nearing the end of November and all self-respecting snakes are SUPPOSED to be sleeping away in a hole somewhere until spring rolls around. But with temperatures remaining in the high 60's to low 70's during the day, I guess he though spring had already arrived and he crawled out to catch some rays! This wasn't a huge snake. He was a teenager...big enough to scare me, but not big enough to scare the total crap out of me. Unfortunately, Zoe saw him about the time I did and she was going to see if he wanted to play. 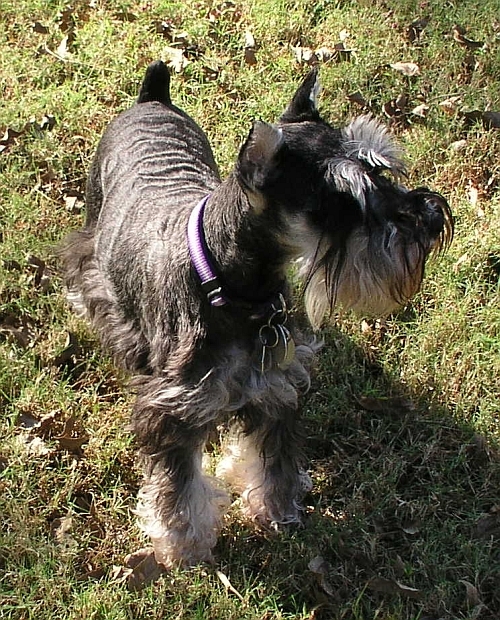 So rather than kill the darned thing, I had to grab Zoe and by the time I came back outside, he was gone (he's smarter than the possum). 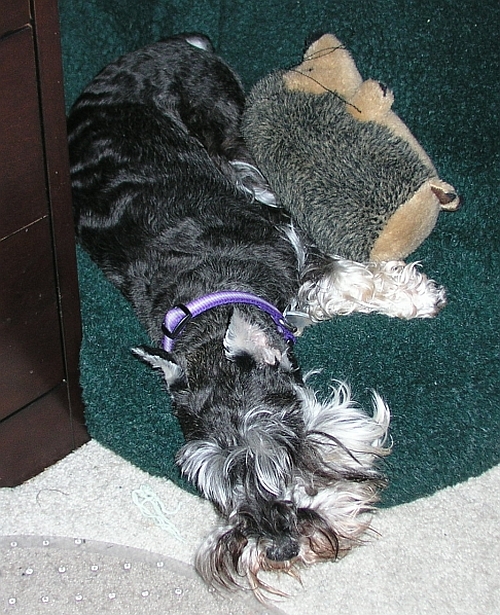 Here she is, after a long hard day of play, snuggled up with one of her many favorite toys, Hedgie the Hedgehog. Wishing you and those you love a very Happy Thanksgiving! May you be blessed and have much to be thankful for. 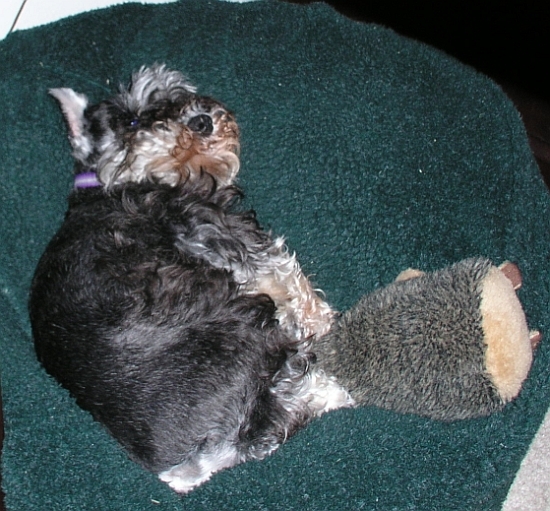 Here's Zoe in her bed again. She's VERY THANKFUL for her snuggle ball bed! I'm very thankful for Zoe. 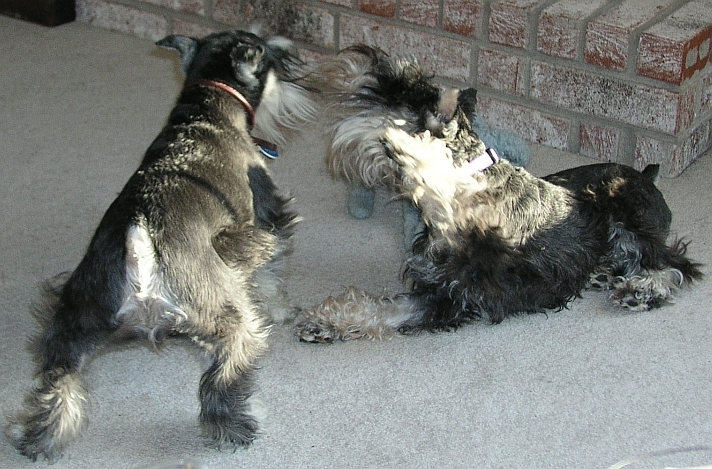 What's more fun than one Miniature Schnauzer? Why, three of them, of course!!! A small miracle. They all sat obediently while I took the picture. 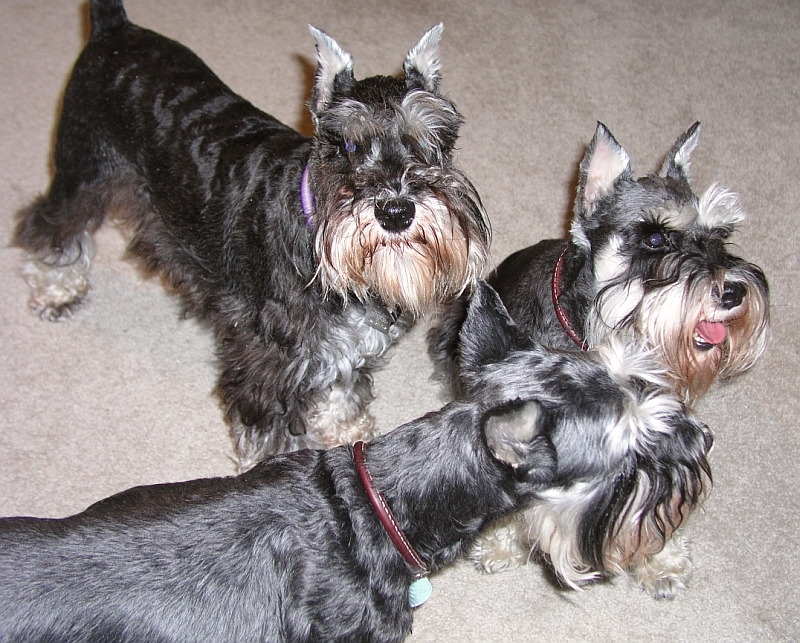 Zoe is on the left, Tori is in the middle and Molly is on the right. Molly is a little bigger than Zoe and Zoe is a little bigger than Tori, so they are like stair steps. 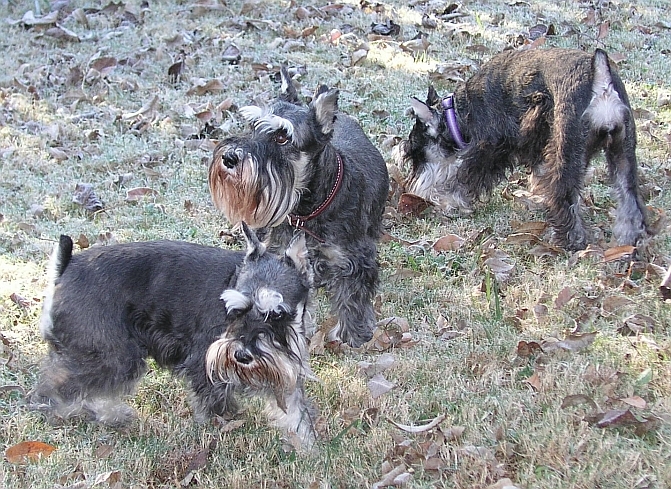 Checking out the yard together...Tori, Molly & Zoe. 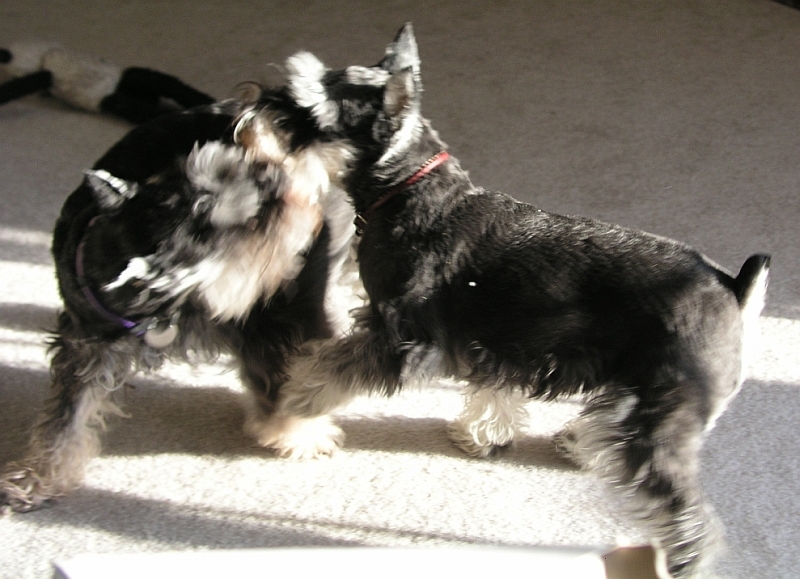 Playing in the sunshine...Zoe and Tori in wild action. Can you look cute for the camera? I think we can manage! 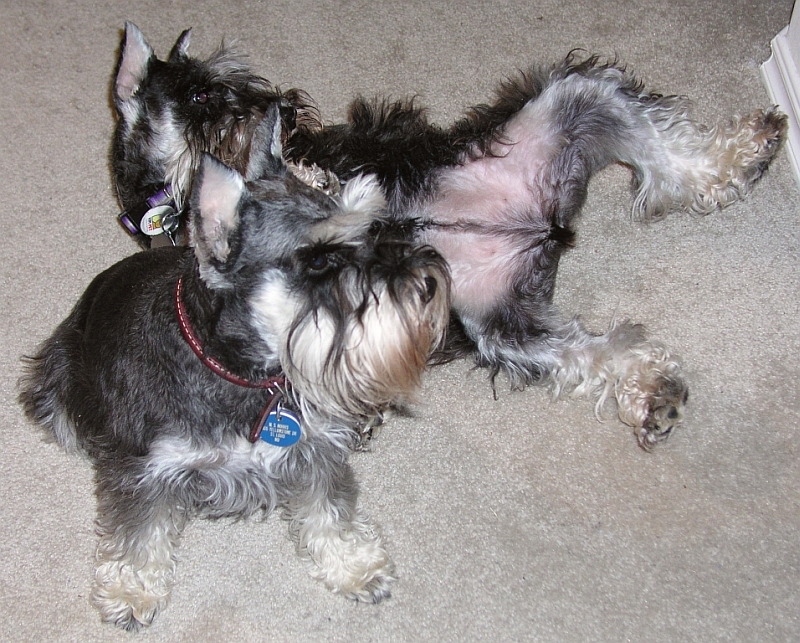 Tori and Zoe (who is belly up) in the first picture. Zoe in the back, Tori to the right and Molly in front in the 2nd picture.